Taiwan (officially the Republic of China [ROC]) is an island located 160 km (100 miles) off the southeast coast of China, opposite Fukien Province, astride the Tropic of Cancer halfway between Japan and the Philippines. Two-thirds of the island of 35,883 km2 (13,855 square miles) is mountainous. 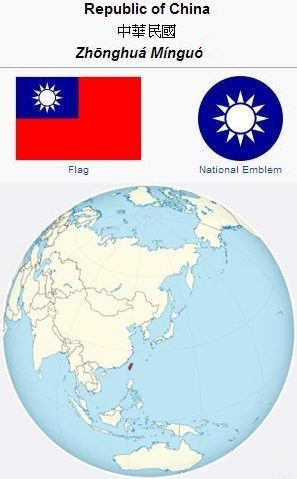 Formerly known as Formosa (Portuguese for "beautiful island"), Taiwan (Chinese for "terraced bay") is governed by the Nationalist Chinese party (Kuomingtang) as the Republic of China. In 2013 Taiwan had an estimated population of 23,373,517. The island was first occupied by Taiwanese aborigines. In the 17th century both the Dutch and the Spanish established trading outposts on the island. In 1662 the Dutch, who had earlier expelled the Spanish, were expelled by pro-Ming loyalists from mainland China, and the first Han Chinese kingdom was established. The Han Chinese continued to settle on the island and became the majority population. Taiwan came under Japanese control in 1895 but reverted to China in 1945. When the Communist Party of China established the People's Republic of China in 1949, the Republic of China (Nationalist Chinese) government of Chiang Kai-shek relocated to Taiwan. In 2009 the Han Chinese constituted 98% of Taiwan's population, including the Hokkien (70%), the Hakka (14%), both early Han Chinese immigrants, and later Han Chinese emigrants from mainland China that settled in Taiwan after 1945 (14%). The other 2% were Aborigines, composed of 14 Austronesian ethnic groups. Mandarin Chinese is the official language, though the Taiwanese dialect is the mother tongue of the majority. Buddhism, Taoism, and religious Confucianism along with popular folk religion are practiced by the people of Taiwan. Only three percent of the population was considered Christian in 1986. The Presbyterian Church of England began mission work in southern Taiwan in 1865 under James Maxwell, and in 1872 George MacKay from the Presbyterian Church of Canada began medical and evangelistic work in northern Taiwan. In 1986 the Presbyterian Church was the largest and oldest Taiwanese Christian church. Following World War II, numerous other mission groups entered Taiwan to establish churches. In 2005 81.3% of the population of Taiwan was religious, and 14-18% were non-religious. The largest religious groups were Buddhism (35.1%), Taoism (33%), Yiguandao (3.5%), Protestantism (2.6%), and Roman Catholicism (1.3%). The majority of Taiwanese people usually combine the secular moral teachings of Confucianism with their religion. Mennonite Churches in Taiwan, 1980s. Mennonite Encyclopedia, v. 5, p. 870. Mennonite Central Committee (MCC) was invited by the Presbyterian Church to begin relief and medical work in Taiwan in 1948, and the General Conference Mennonite mission followed with church planting work in 1954. In 1986 there were 17 Mennonite congregations of the Fellowship of Mennonite Churches in Taiwan located in three major cities of Taiwan. In addition the Mennonite Christian Hospital was located on the east coast. In 2012 the Fellowship of Mennonite Churches in Taiwan has congregations located in three major urban areas: Taipei and Taoyuan, Taichung, and Hualien. Kraybill, Paul N., ed. Mennonite World Handbook. Lombard, IL: Mennonite World Conference, 1978: 183-187. Mennonite World Conference. World Directory = Directorio mundial = Répertoire mondial 2012: Mennonite, Brethren in Christ and Related Churches = Iglesias Menonitas, de los Hermanos en Cristo y afines = Églises Mennonites, Frères en Christ et Apparentées. Kitchener, ON: Mennonite World Conference, 2012: 12. Sawatzky, Sheldon V. "The Gateway of Promise: A Study of the Taiwan Mennonite Church and the Factors Affecting Its Growth." MA thesis, Fuller Theological Seminary, 1970. Wikipedia. "Taiwan." 9 May 2014. Web. 19 May 2014. https://en.wikipedia.org/wiki/Taiwan. Sawatzky, Sheldon V. "Taiwan." Global Anabaptist Mennonite Encyclopedia Online. May 2014. Web. 25 Apr 2019. http://gameo.org/index.php?title=Taiwan&oldid=160387. Sawatzky, Sheldon V. (May 2014). Taiwan. Global Anabaptist Mennonite Encyclopedia Online. Retrieved 25 April 2019, from http://gameo.org/index.php?title=Taiwan&oldid=160387. Adapted by permission of Herald Press, Harrisonburg, Virginia, from Mennonite Encyclopedia, Vol. 5, pp. 870-871. All rights reserved. This page was last modified on 11 April 2018, at 05:58.